IDENTIFY- Yes, this is awkward, but sometimes odors go unnoticed by owners. If the house smells like wet dogs or a litter box, it’s not going to help you sell. If you think it might stink, I suggest that you directly ask someone you trust—“Does my house stink?” Tell them to be honest and don’t hold it against them! In order to solve a problem, you first have to identify it. ACTION- Now that you’ve found the problem, start fixing it. Invest in a good deodorizer—not just an odor masker. Hire professional carpet cleaners (ask about pet enzyme treatments if needed) and clean up all pet areas, both as accidents occur and on a daily basis. Showings can happen at any time—don’t be caught off guard. If your pets roam free while you are out of the house, then it may be wise to ask for 1-2 hour showing notice. Discuss the pros & cons of requesting notice from your real estate agent. 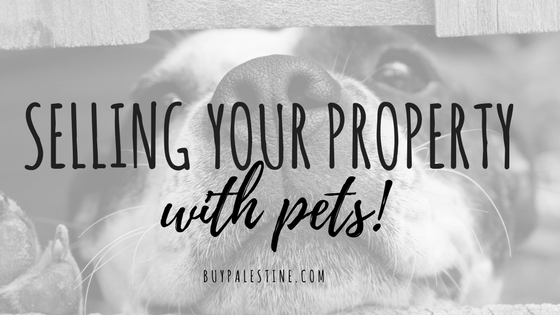 PETS DURING SHOWINGS- Once you’ve corrected any problem areas and are maintaining it, now you’ve got to prep before showings (or better yet, before you leave the house for the day—just in case!) Scoop litter boxes, clean cages and pick up pet waste from the yard everyday. Don’t let a “gift” from your pet kill the sale (or tracked throughout your house during the showing)! GONERS- Just like you shouldn’t be present at the home during a showing, neither should your pet. If possible, take Fido for a walk or a car ride. If removing the pet for the showing isn’t possible, make every effort to temporarily use a kennel or crate—especially if your pet is an escape artist. You want to avoid any possibility of the pet getting loose or lost without you even being home. Fluffy and Fido are not the first thing you think of when it comes time to prep your home to sell, but it can be critical to the end sales price or if it even sells at all. Is it a total pain in the keister? Yup! Is it worth it in the end? Yup! If you price to sell and show off its assets, you shouldn’t have to keep your pet-friendly home “24/7 show ready” for long.